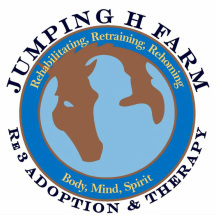 Jumping H Farm Re3 Adoption and Therapy is dedicated to Rehabilitating, Retraining, and Rehoming horses in need of a second career. Currently we are focused on Retired Race Track Thoroughbreds who can no longer race. We are proud to partner with Turning for Home (501c non-profit) dedicated to rehoming OTTB that come from the PARX race track. Please click on the logo to be redirected to JUMPING H FARM RE3 site.